I have wanted to make a galette for AGES. I don’t know why it’s taken me this long, actually! It’s a well-known fact that we eat with our eyes and I seriously am a sucker for pretty food. 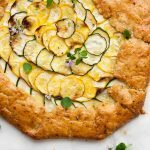 I LOVE how rustic galettes are – they almost look better than a regular, meticulously lined tart and yet they are a million times easier to make. And everyone loves easy, don’t they? 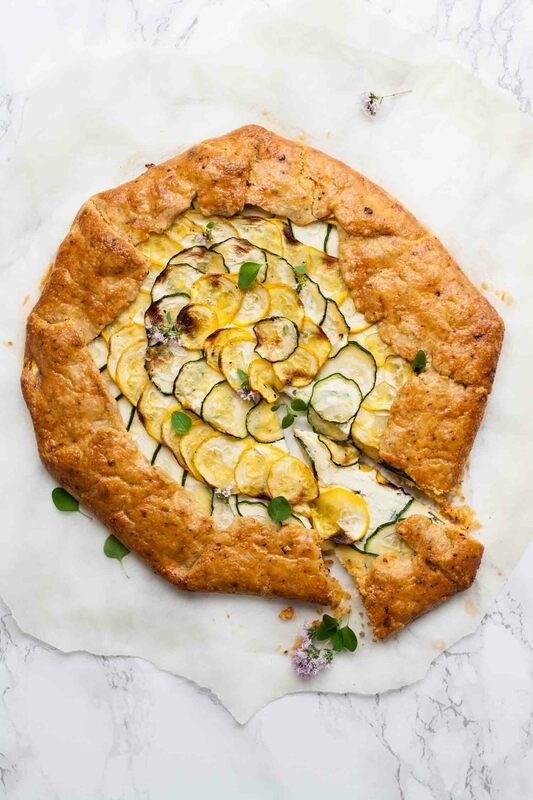 This Mexican Courgette and Ricotta Galette is super easy to make and tastes like a dream! Apparently we’re due a heatwave over the next couple of weeks, which means picnic weather! 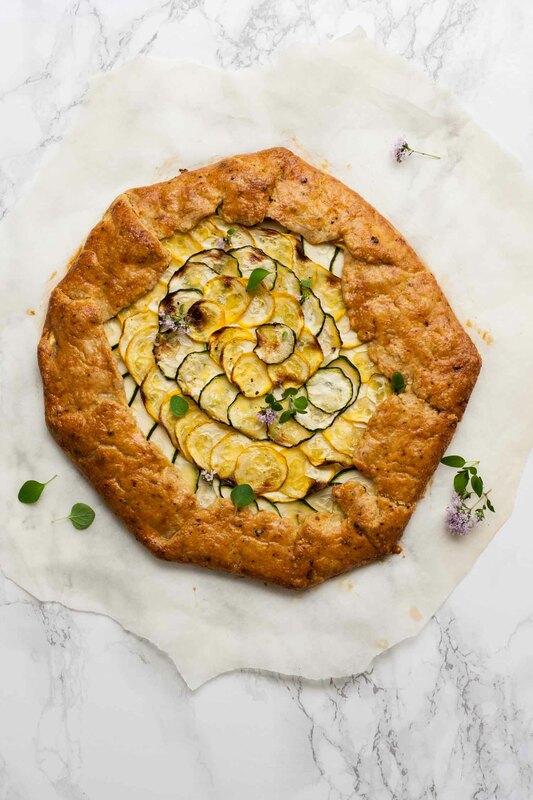 Why not take this gorgeous galette as a picnic offering? It’ll be sure to impress. I love a sweet treat, I really really do. But boy oh boy do I love savoury things. You’ll know if you’ve been following along for a while that I am a savoury breakfast girl through and through, but that I’ve been training myself to eat sweeter things for breakfast, like smoothies and overnight oats, mostly for the sake of variety. I can definitely enjoy those things, but in the past week or two it’s all come to a head and I’ve been DESPERATE for my old faithful. It’s been like, it’s savoury or it’s no breakfast. No breakfast – can you even imagine that?! Err nope. So, this isn’t even a post about breakfast but I just needed to prove to you my intense attachment to savoury foods. If I’m seriously hungry, I will never reach for sugar to cure that. 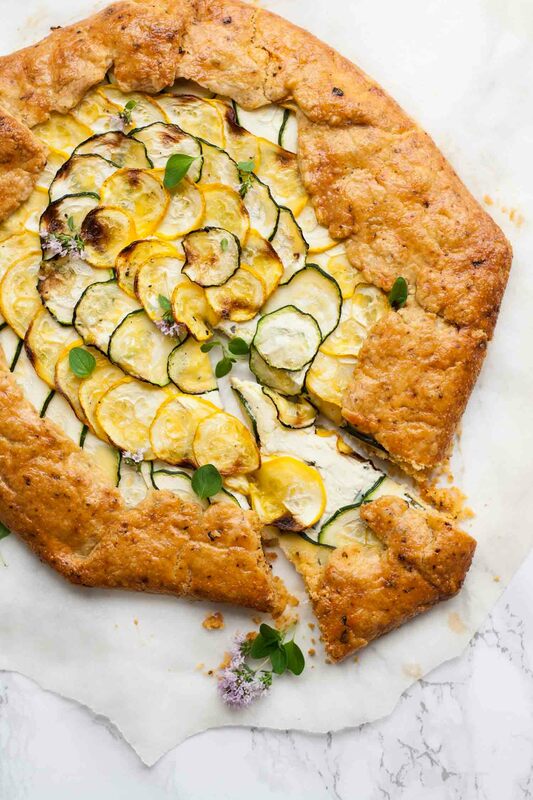 Nope, it’s this Mexican Courgette and Ricotta Galette to the rescue for those hunger pangs! 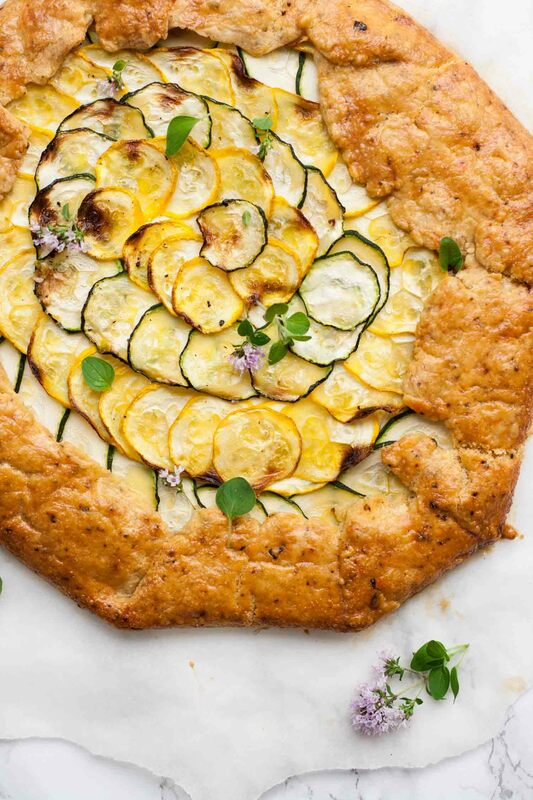 This Mexican Courgette and Ricotta Galette is real simple food, done well. 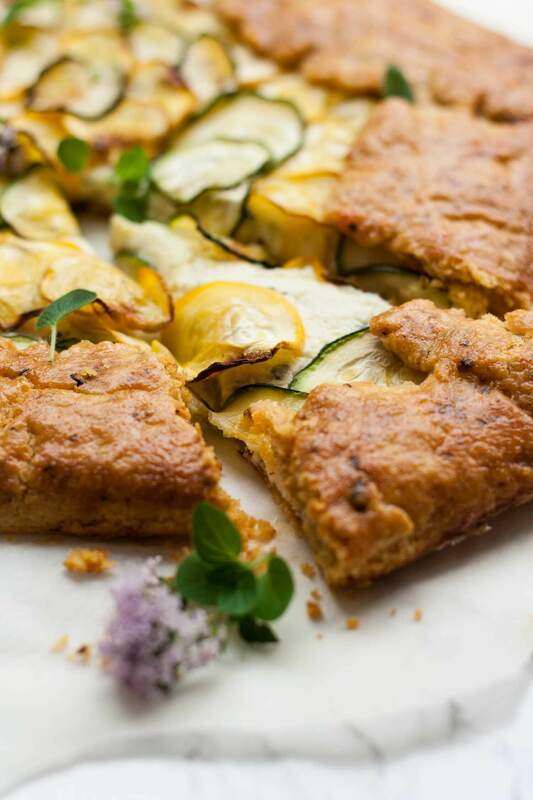 There’s an abundance of courgettes at this time of year which I love! They’re such a versatile ingredient and just so delicious! My absolute favourites are the yellow ones. I told you I get so excited about pretty food! I’ve tried growing them numerous times and the plants always die on me – does anybody know why that is? Are they just a lot more fussy than the green variety? Anyway, even though my yellow plant didn’t produce for me this year it didn’t matter too much because I found them at my local greengrocer. And of course I just had to make a galette and make a pattern out of the two different colours! It’s all about the simple things in life! I made the ricotta myself because I have a cheese-making kit and it’s just really easy to do. But there is absolutely no need for you to do the same (unless you want to of course!) and store-bought ricotta is perfectly fine. I chose to go with Mexican flavours because I just love it and I wanted to do something a little bit different. I believe that the Mexican equivalent of ricotta would be requesón but having never (yet!) had the privilege of going to Mexico, I have never tried it. If you have it available to you then use it! I flavoured the ricotta cheese with garlic and oregano to make the most delicious base for the courgette slices to sit atop. Having never made a galette before, I had to do plenty of research into the type of pastry I needed to use for the crust. In the end I settled on this cornmeal pastry from Tieghan’s beautiful galette which I adapted ever so slightly. Cornmeal crust just seemed the right way to go for a Mexican-themed galette! Oh and it was definitely the right choice – that crust was so good! I boosted the flavour right up with a good helping of Mexican oregano and chipotle chilli flakes. Yum! 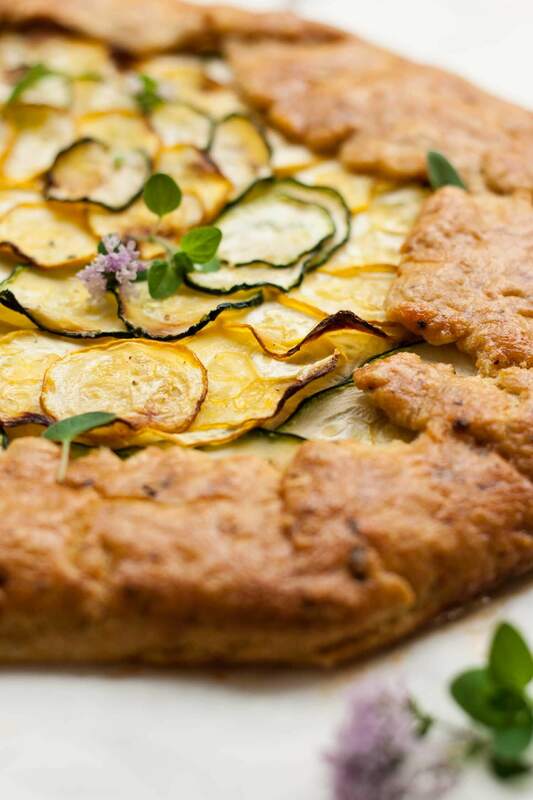 This galette isn’t exactly quick to make but it’s certainly not difficult either. This is one of those lazy afternoon baking projects and the results are spectacular! I really do hope you give it a try! Start by preparing the crust. Place the flour, polenta, salt, chipotle chilli flakes and oregano into your food processor and pulse briefly to mix. Add the butter to the processor and pulse until the butter resembles small peas in the flour. Pour in 4 tablespoons of ice cold water and continue to pulse until a ball of dough forms, adding a little more water if necessary. Tip the dough out onto a floured surface and pat gently to form a disc. Wrap in cling film and refrigerate for 30 minutes. In a small bowl, mix together the ricotta, fresh oregano, garlic and oil until well combined. Season with salt and pepper. Once the dough has chilled, remove from the fridge and roll out on a floured surface so that it's about 1/8" thick. Transfer the rolled out dough to a baking tray lined with parchment paper. Spread the ricotta mixture over the crust, leaving a border a couple of inches wide around the edges. 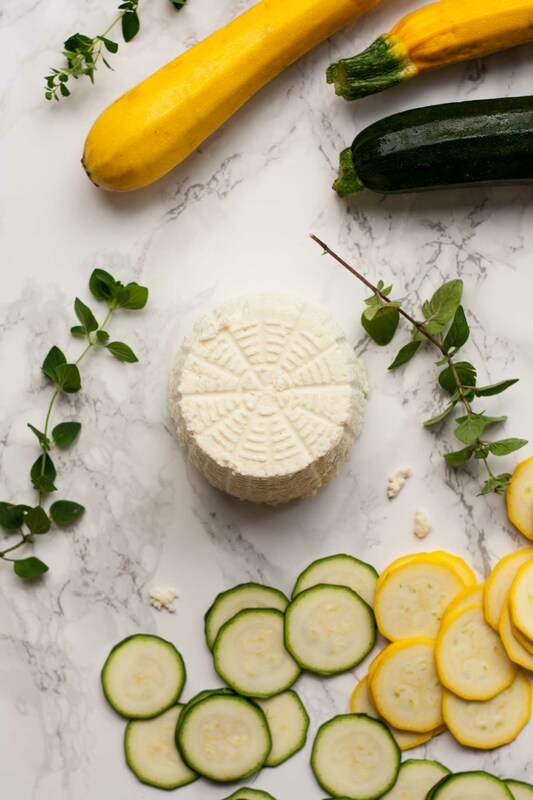 Lay the courgette slices in a concentric circle pattern on top of the ricotta. Brush the courgettes with a little oil and sprinkle with salt and pepper. Preheat the oven to 180°C/350°F (fan) or hotter for conventional (190°C/375°F). Brush the edges of the dough with the beaten egg and place in the fridge for 15-20 minutes to rest before baking. Bake for 45 minutes or until golden brown. Allow to cool a little before slicing. I use a fan oven so you may need to increase the temperature of your oven and/or the length of cooking time. If you are sensitive to spice, reduce the chipotle chilli flakes to 1/2 teaspoon. Crust recipe slightly adapted from Half Baked Harvest. Thanks Hana! It really was delicious. OMG ! These photos !!!! Not taking about that recipe that looks delish as well ! !